If you didn’t know the Rules of Survival game suddenly becomes unavailable in the Steam store and when you go to its page, it just redirects you to the Steam homepage. It seems it was removed from the Steam Store. There are lot of speculations that it has something to do with the PUBG copyright, but somehow this speculation is not true according to the Dev Team. People who already purchase the game can still access the Rules of Survival on their Steam library and can still play the game without any problem. The discussion board is accessible as well, the Dev Team even announce the information regarding the removal of the game from the Steam store. There has been much speculation about the sudden removal of RoS from Steam today, we would like to clear up some of the information that has been spreading. 1. The Steam Store page has been archived and is unavailable to new survivors at this point. We are currently working with Steam to get it back up ASAP. 2. We would like to reassure survivors that if you have already purchased the game, your game data is safe and you can still continue to play the game now, without any interruption. We deeply apologize for the inconvenience caused and wish to thank the RoS Community for their understanding and support. The removal of the game seems some kind of automation from the part of the Steam store that makes their game in archived mode. However, the dev didn’t explain everything – what is exactly the cause of the archiving? but NetEase assures the Rules of Survival will be back in the Steam store and will be available for new users. Based on the Steam chart, the game has a 24-hour peak of 4,999 concurrent users today, which just a sign that the game are still accessible to players who already bought the game. For new users, you can still play Rules of Survival at https://www.rulesofsurvivalgame.com/. If you didn’t know the Rules of Survival game suddenly becomes unavailable in the Steam store and when you go to its page, it just redirects you to the Steam homepage. It seems it was removed from the Steam Store. There are lot of speculations that it has something to do with the PUBG copyright, but somehow this speculation is not true according to the Dev Team. People who already purchase the game can still access the Rules of Survival on their Steam library and can still play the game without any problem. The discussion board is accessible as well, the Dev Team even announce the information regarding the removal of the game from the Steam store. The Dev Team says: There has been much speculation about the sudden removal of RoS from Steam today, we would like to clear up some of the information that has been spreading. 1. The Steam Store page has been archived and is unavailable to new survivors at this point. We are currently working with Steam to get it back up ASAP. 2. We would like to reassure survivors that if you have already purchased the game, your game data is safe and you can still continue to play the game now, without any interruption. We deeply apologize for the inconvenience caused and wish to thank the RoS Community for their understanding and support. The removal of the game seems some kind of automation from the part of the Steam store that makes their game in archived mode. However, the dev didn’t explain everything - what is exactly the cause of the archiving? but NetEase assures the Rules of Survival will be back in the Steam store and will be available for new users. Based on the Steam chart, the game has a 24-hour peak of 4,999 concurrent users today, which just a sign that the game are still accessible to players who already bought the game. 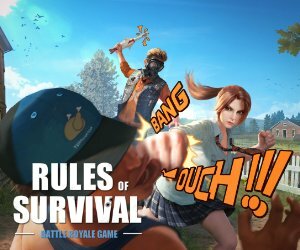 For new users, you can still play Rules of Survival at https://www.rulesofsurvivalgame.com/.